Suggested by Sonic Tetsuya is back and he is up against quite the dragon. 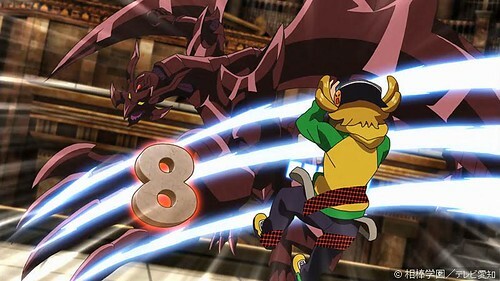 Bloody Moon Dragon is huge and has a whole lot of attack power at his disposal. With this much strength it should be an easy feat for him to defeat the kid one on one. Of course, a Buddyfighter is never alone and together with his army of monsters, Tetsuya will be able to easily overwhelm this dragon. Tetsuya wins. This entry was posted in Battles, Bloody Moon Dragon Battles, Tetsuya Kurodake Battles and tagged Bloody Moon Dragon, Tetsuya Kurodake by dreager1. Bookmark the permalink.